Edward Saydee and Penn Charter look to beat Lansdale Catholic for the third straight year. Five area football teams are headed to the Jersey Shore for games this weekend, with a pair of squads kicking off their seasons. 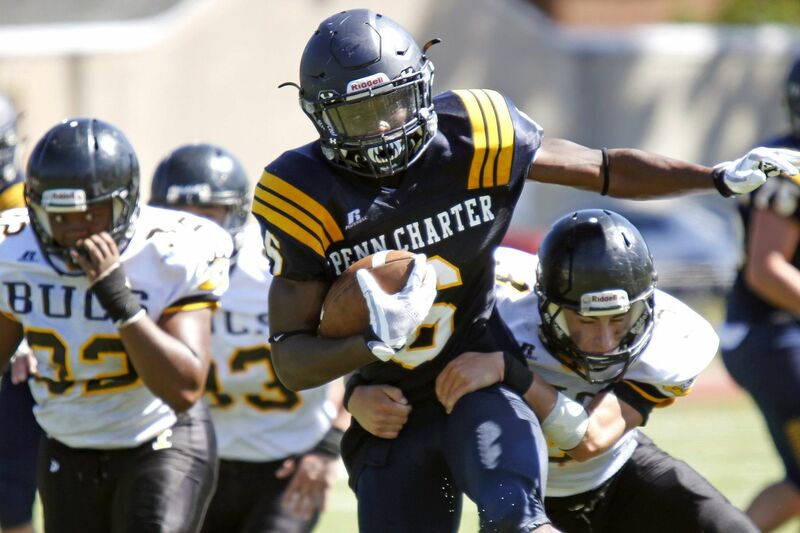 Penn Charter and Lansdale Catholic will look to start on a winning note when they square off at 10 a.m. Saturday at Ocean City High. Two contests are set for Friday at Maxwell Field: Conwell-Egan vs. Salem (N.J.) at 4 p.m., and defending Inter-Ac League champ Malvern Prep against Roman Catholic at 7 p.m.
Neumann-Goretti was set to open its season on Saturday afternoon at Maxwell Field, but its game vs. Avalon (Md.) was canceled Friday morning. N-G coach Albie Crosby said the contest was scratched because, per PIAA rules, the Saints are not permitted to play against a squad that uses fifth-year players. Penn Charter began last year, when it went 9-1 and was the Inter-Ac runner-up, with a 20-6 triumph over Lansdale Catholic. The Quakers return two-way back Edward Saydee. The 6-foot, 185-pound senior and Temple recruit rushed for more than 1,100 yards and scored 15 touchdowns last season. Lansdale Catholic's Danny Dutkiewicz likewise netted 1,100-plus yards on the ground last year. The 6-0, 200-pounder, who doubles as a linebacker, scored 10 touchdowns. Conwell-Egan halfback and Boston College recruit Patrick Garwo carried 15 times for 178 yards and two scores last Saturday night in a win over visiting Roman. The Cahillites will have their hands full with a Malvern Prep offense spurred by quarterback Drew Gunther, receivers Keith Maguire and Tygee Leach, and offensive linemen Jake Hornibrook (6-4, 275) and Will Redden (6-6, 295). Junior quarterback Jack Machita and La Salle will visit North Penn at 7 p.m. Friday at Crawford Stadium. Springside Chestnut Hill (0-0) at Father Judge (1-0), 6 p.m. Judge will play its first varsity game at the James J. Ramp Athletic Complex. Pick: Judge, 20-14. Haverford School (0-0) at No. 10-ranked Northeast (1-0), 6:30 p.m. The Vikings ballcarriers should try to stay clear of 6-5, 285-pound lineman Asim Richards. Pick: Northeast, 19-14. DeMatha Catholic (0-1) at No. 3 Imhotep Charter (1-0), 6:30 p.m. One of the headliners for the Maryland powerhouse is safety and Alabama recruit DeMarco Hellams. Pick: DeMatha, 36-23. No. 14 La Salle (0-1) at No. 5 North Penn (1-0), 7 p.m. The Explorers hold a 7-3 advantage in the head-to-head series. Pick: North Penn, 23-16. Pennsbury (0-1) at No. 16 Penn Wood (1-0), 7 p.m. The host Patriots are ignited by QB Desman Johnson Jr. and wideout Kennedy Poles. Pick: Penn Wood, 26-19. No. 21 Penn Charter (0-0) vs. Lansdale Catholic (0-0). The Quakers knock off the Crusaders down the Shore for the third straight year. Pick: Penn Charter, 27-13.